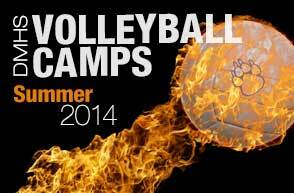 Description: Campers will learn all of the basic volleyball skills through fun filled drills and competitions. Every camper will receive a t-shirt and certificate. Description: Advanced campers will be exposed to high level drills and competitions. All campers will receive a t-shirt and certificate. 4. Once you get to the list of summer camps, scroll down until you find the camp you would like to register for—either the “DMHS Volleyball High Intensity Advanced 9-12th Grade Camp” or the “K-8th Grade All Skills Focus Camp”—then click “enroll” button. Enter your phone number to receive text notifications from the coaches. DMHS's volleyball program has a history of success and recognition in many ways. Copyright ©2013 DMHS. Web development and online marketing by Phoenix advertising agency FabCom.